White Wolf : Raccoon Casually Hops On The Subway Like A Total "Boss"
Raccoon Casually Hops On The Subway Like A Total "Boss"
It took some serious courage for one little raccoon to board that train full of humans … the kind of guts and gall subway rats everywhere would probably envy. "He was walking under the seats nonchalantly, like it's another day on TTC [Toronto Transit Commission]," Tatyana Marayeva, who was on the train on Tuesday's morning commute. One woman stood up on her seat when the raccoon passed.But most of the passengers held themselves together fairly well, according to Marayeva. "I must admit, that people's reaction was very Canadian," she said. "Nobody was freaking out or screaming." 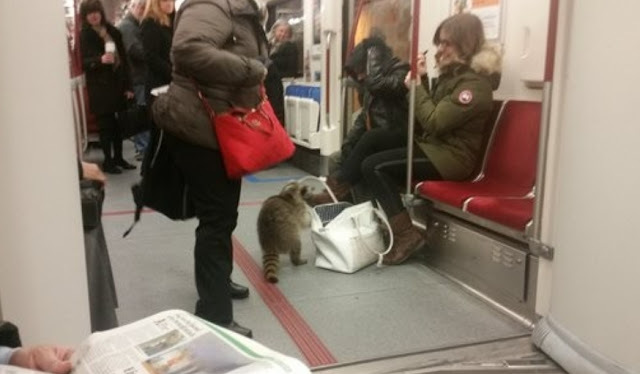 The raccoon then proceeded down the cart and shared a moment of eye contact with a woman before pawing through the open bag at her feet.When the train arrived at the Spadina station in Toronto, the doors opened up and a conductor couldn't help but laugh as he made the announcement. "Ladies and gentlemen!" Marayeva recounted. 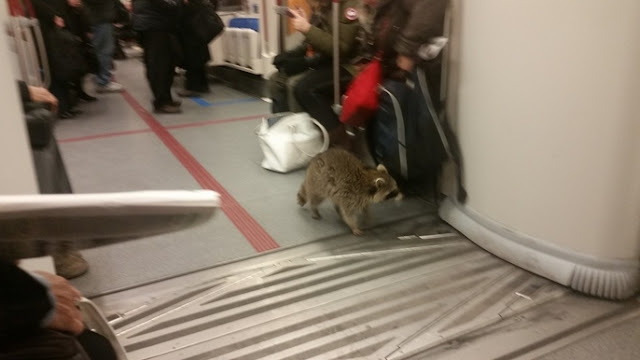 "This train is out of service due to ... uhm ... a raccoon!" 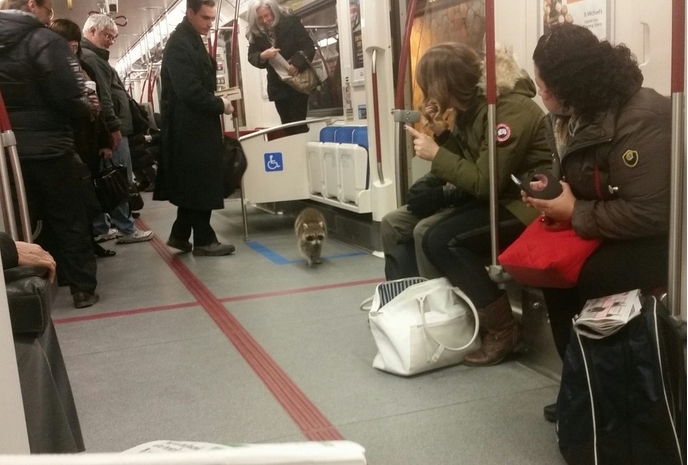 At that point, everyone politely exited the train and waited for the raccoon to follow. Eventually, he made his way to the platform. Fortunately, the delay was brief, and the raccoon ended up continuing his adventure through the tunnels of the human world. At that point, people chuckled and joked among themselves, according to Marayeva. The raccoon may have startled a few people, but all in all, his visit was a pleasant disruption for the commuters' Tuesday morning. 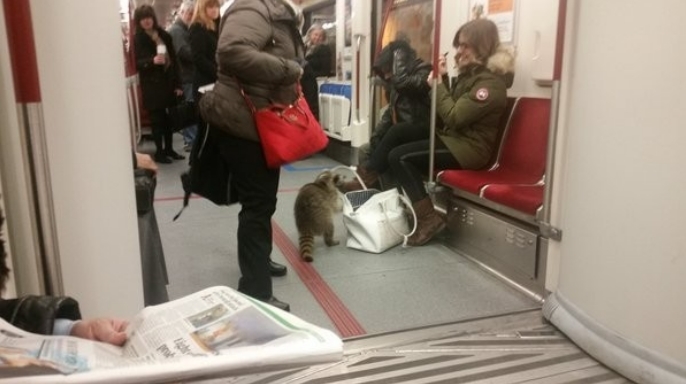 Responses to "Raccoon Casually Hops On The Subway Like A Total "Boss""
Poor little guy may have been someones pet that got loose. Hope someone helped him. These little masked creatures are scared of nothing, not even dogs. They will go where they want and do what they want. He is not lost or confused, the little darling is just being a normal raccoon, and he will bite you if you interfere. They can be nasty little things and Alberta is horrified that they are now being seen here. Getting pretty gutsy but I am sure they will have the same welcome as the coyote, bullet. I love watching them, but not near my house. Unfortunately houses will be in their path so we know the outcome.